Would the Karen, who posted a comment on the Pay if Forward post, please contact me by leaving a comment on this post with your email address in it. Your email address will not be seen by anyone but me. You were the winner and I would like to mail your surprise. If I have not heard from Karen by Monday, June 1st, I will select a new winner from everyone that posted a comment on the original post. I hope everyone has a safe Memorial Day. 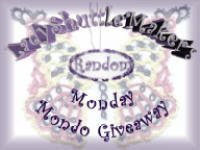 Bearbits is hosting a new giveaway. It is a beautiful handmade bear and pincushion. Go check it out. Here is the fourth snowflake in the Round Robin. It was sent to Abby Carlson. 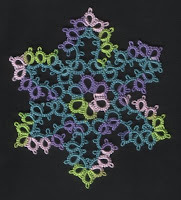 The pattern is the "Pirouette" design from Tatted Snowflake Collection by Jon Yusoff. Of course, I used more Lizbeth thread. The color numbers are 115 and 661. It is so much fun to participate in the Round Robins. Each of the snowflakes that I received will be treasured. Thank you to each one who exchanged with me. Also, thank you Sharon and Christine for all the work you did to keep us mailing in a timely manner. This heart was a replacement heart tatted for Laura Blanton. Her round robin heart package never returned home to her. So I tatted hers again. 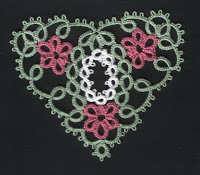 The pattern is from Tatting Hearts by Teri Dusenbury. Laura, I am so glad that you are doing better. I hope this heart brightened your day when you felt so bad. I also hope it will go with all the beautiful tatting in your bedroom. The Karen that responded to my first post, please contact me. You are the PIF winner. Please leave a comment with your email address--it will not be posted.